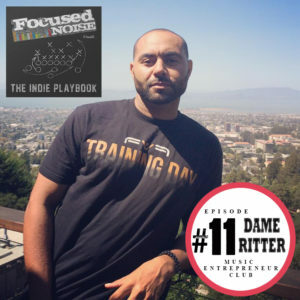 Dame Ritter is best known as the co-founder of the successful Indie Hip-Hop label Funk Volume (Hopsin, Dizzy Wright, Jerren Benton). After the dissolution of the label, Dame founded the Music Entrepreneur Club, a music business educational platform. Dame also continues to work with a select group of artists, including Dizzy Wright and their Still Movin’ Movement. After all of his accomplishments, Dame continues to keep striving for more success, and both his persistence and business acumen are on display throughout the interview. This is a great episode for anyone interested in building their own label, brand, or business. Take notes. 48:56 At some point you’ve got to jump!